Just as our cats and dogs love to spend time outdoors during the warmer months, so do our flea critters. These pesky parasites thrive during the summer and will be out in force in our parks, meadows and even our gardens. The warm and humid British summer weather provides the optimal conditions for fleas, which means that they can rapidly replicate, going from egg to adult in just 14 days – eek! Fleas won’t wait for an invite and will be only too happy to hop onto your unsuspecting pet, as they adventure outdoors. So, as your pooch is chasing and playing with doggy pals in the park and throwing themselves onto the grass (to show-off their signature ‘James Bond style’ doggy rolls), they could find themselves with more than just grass in their fur and feeling rather itchy! Our feline friends aren’t off the hook either and with all this fine weather our cats will be prowling their neighbourhood and stalking their prey through the neighbouring gardens, fields and undergrowth. This means they too could find themselves accidentally stumbling into flea territory and picking up a few fleas along the way. However, your pet doesn’t need to go far to find themselves just a whisker away from a flea. 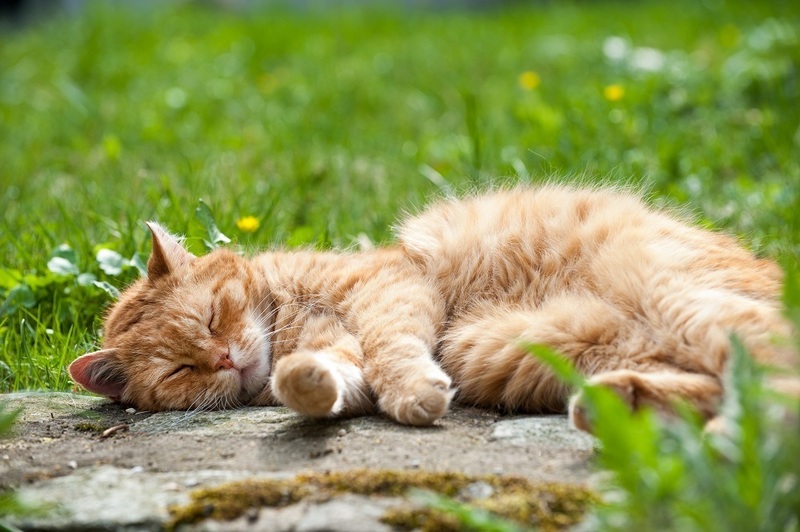 In fact, fleas can be lurking in your own garden, brought in by infested wildlife and visiting cat friends. So, even if you have a pet who doesn’t adventure beyond the safety of your garden, they could still be at risk of a flea attack. Therefore, whilst your Persian is innocently stretched out basking in the sun or your Spaniel is snoozing in their favourite spot in the garden, they could get more than they bargained for and wake up with a ‘flea in their ear’. Lurking in that cool, lush summer grass, could be thousands of hungry new fleas, just waiting to hop on board your unsuspecting pet. This summer, remember, fleas are never far away from you or your pet. Therefore, it’s important to ensure that all pets are protected from fleas, by regularly applying a FRONTLINE® flea and tick treatment. FRONTLINE Plus contains fipronil and (S)-methoprene. UK: NFA-VPS. FRONTLINE Spot On contains fipronil. UK: AVM-GSL. Further information available in the SPC or from Merial Animal Health Ltd, RG12 8YS, UK. FRONTLINE is a registered trademark of Merial. ©2018 Merial Animal Health Ltd. All rights reserved. Merial is now part of the Boehringer Ingelheim Group of Companies. Date of preparation: Jun 2018. PE2592. Use Medicines Responsibly.